Cruising. This is a gold foil, but it's more chunky than most gold foils. Instead of a smoother, more chrome-like look, Cruising has a very defined-particle gold flake look. Extravaganza. Coral with gold and green shimmer. The sunlight picture shows the shimmer better but the indoor shot is more color-accurate. It's definitely a bright coral, not a dusty one, and it has a lot of pink to it. Femme. Bubblegum pink frost. This one had quite a few chunks of unmixed pigment in it, even through I shook it before using it. Can't say I'm a fan of frosty pink, but at least some of the frosty shimmer looks green in certain lights. Pansy. This is weird because I have a pair of yoga pants that are THIS EXACT COLOR. Weird because it's such an exact match and also because I don't have many polishes this color. It's a light purple, very pink looking... Hard to describe. I've seen this color referred to as 'orchid' before, and I did have an orchid this color at one point, so let's call this one orchid-colored. It's really creamy looking. That sounds weird, too... But I've just never seen many polishes that look this creamy. Don't know how else to describe it! Pool Boy. Gorgeous light blue creme. It seems a little more aqua/turquoise on my skin, but in the bottle it looks pure sky blue to me. My favorite of the collection. Very flashy without being bright or obnoxious- really stands out on my nails. The formula is varied but reasonable on these. I did three coats of all and all needed the three coats. Some were thick (Pool Boy, Pansy), some were watery (Palare, Cruising), and the others had a more even, middle-of-the-road medium texture. Drying time was good. I used topcoat on these, but the two creme shades dry extremely glossy without topcoat. 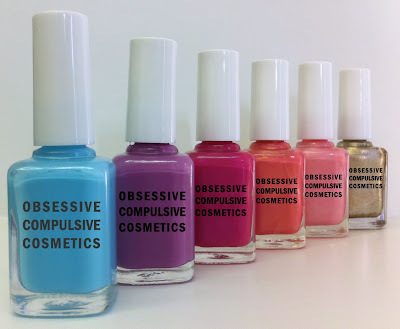 I'm personally not into the pink-heavy palette of this collection. I do like the theme, though- all the colors together portray this sort of retro, Hollywood, glamorous pool-party image to me. My top picks are Pool Boy, Pansy and Palare. Just noticed that three of the six shades in the Pretty Boy collection start with 'P'. That orange one is calling my name. 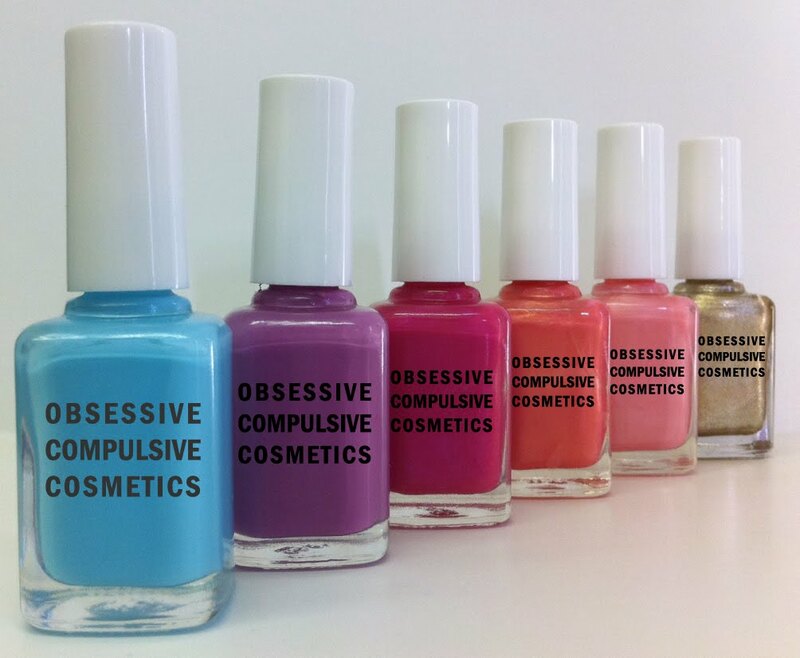 Obsessive Compulsive Cosmetics / OCC Pretty Boy is available directly from their website. 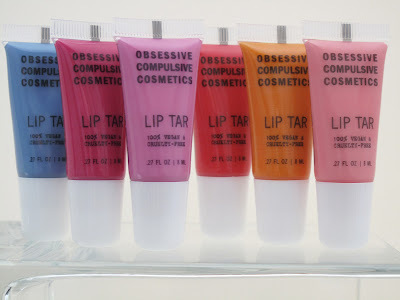 While you're there, don't forget to check out the Garage Sale to score some Lip Tars and Nail Lacquers at a discount! I have swatches of almost everything on sale here. Oh, Pool Boy, p-r-e-t-t-y! I am definitely adding this to my must-purchase ASAP list. These are all really pretty, but they don't look like fall colors to me. Your swatches look awesome though!!! Pool Boy, Pansy and Palare are gorgeous! Wish I could get them over here. And the Lip Tar versions look really nice as well. I would wear these in Summer, not Autumn. My faves are definitely palare and pansy, I wonder where I can get hold of them in the uk? its not a brand I've heard of over here. Ooh!! I love them! I am pretty sure I need them all. Really love Palare and Pool Boy. Cruising looks like a OPI's Dazzled by Gold but maybe in a slightly more opaque base, but I could be off. Either way I love it. These look more like a Spring/Summer collection. Lots of pretties there. Pool Boy and Palare caught my eye. Lovely swatches! definitely learned something new today - thanks for the wikipedia link. what an interesting theme on this collection! Palare has my name all over it! Great fuchsias - I can never resist! Gotta have Pansy and pool boy! Femme, Pansy and Pool boy will be mine! Oh yes!